April 17, 2013 at 12:09a.m. Phantoms defenseman Ryan Lowney moves to keep the puck away from Des Moines’ Luke Voltin during a game at the Covelli Centre. Lowney is one of the Phantoms’ penalty killers. Their unit is ranked first in the USHL. A year ago when Youngstown took on Green Bay in the USHL playoffs, the fourth-seeded Phantoms were coming off a two-game sweep of the Cedar Rapids RoughRiders while the Gamblers had been idling after a bye earned from the top record in the Eastern Conference. This time, the teams appear to be a lot closer. Going into the final weekend of the regular season, the Gamblers (37-23-4, 78 points) and Phantoms (37-37-0, 74 points) were tied. The Phantoms’ 3-2 loss to the Chicago Steel last Friday gave the Gamblers second place and home-ice advantage for the best-of-five series that begins tonight in Wisconsin. “Our program has taken steps so that I don’t think it’s a David vs. Goliath situation against anyone,” Phantoms head coach Anthony Noreen said. “Having said that, are they the favorite in this series? Absolutely. Last year, the Gamblers ousted the Phantoms, 3-1, then went on to win the Clark Cup. The Phantoms aren’t backing down from the challenge. Green Bay won the regular-season series, 5-1. Four of those games were in the Phantoms’ early tailspin when they lost 11 of 12 games. The two more recent games reflect the tighter standings. 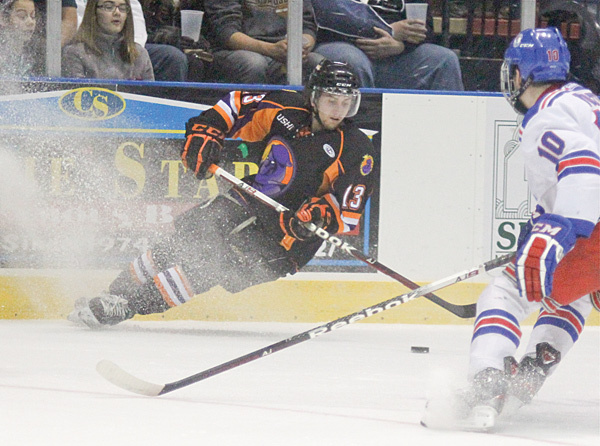 On Feb. 8 at the Covelli Centre, the Phantoms defeated the Gamblers, 5-2. On March 10 in Green Bay, Youngstown lost, 6-4. The key to the series will be how well the Phantoms’ penalty-killing unit — top-ranked in the league — does against the USHL’s second-best power play. Joining Anas up front are Austin Cangelosi, Cam Brown, Alex Dahl and Josh Nenadal, while Lowney, Dan Renouf, Eric Sweetman and Tommy Davis are the backliners. The Phantoms also lead the league in shorthanded goals — 13. Cangelosi has 11 in his two-year USHL career, a league record. Noreen said depth is the secret to Green Bay’s success. The Phantoms won’t have forward Nathan Walker available because of a broken bone in his neck suffered on April 5 in a 5-2 victory over Team USA. Walker was hit from behind and hurt when he fell into the boards. “Probably the scariest thing I’ve ever been a part of in hockey, just seeing the way he went in and the way he went down,” Noreen said. Padulo said Green Bay’s Resch Center, “will be electric. It seats 7,000 so it’s a louder atmosphere there — cowbells and whatnot. April 25, 2013 12:07 a.m.
April 20, 2013 12:05 a.m.
May 12, 2013 12:09 a.m.